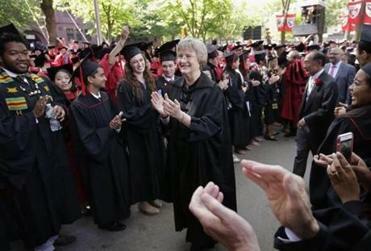 Harvard University president Drew Gilpin Faust, who shepherded the school through the turbulence of the economic recession and expanded its diversity, will step down in June 2018 after 11 years leading the 380-year-old institution. Faust announced her pending departure in an e-mail to students, faculty, and staff Wednesday afternoon, igniting an instant buzz on campus and among alumni and the wider world of higher education. Faust has served longer than typical for university presidents nationwide. She did not say what she plans to do next, only that it is time for Harvard to begin the next chapter. Her departure coincides with the end of the university’s most recent fund-raising campaign, a common time for presidents to depart. The campaign has raised $8 billion so far. 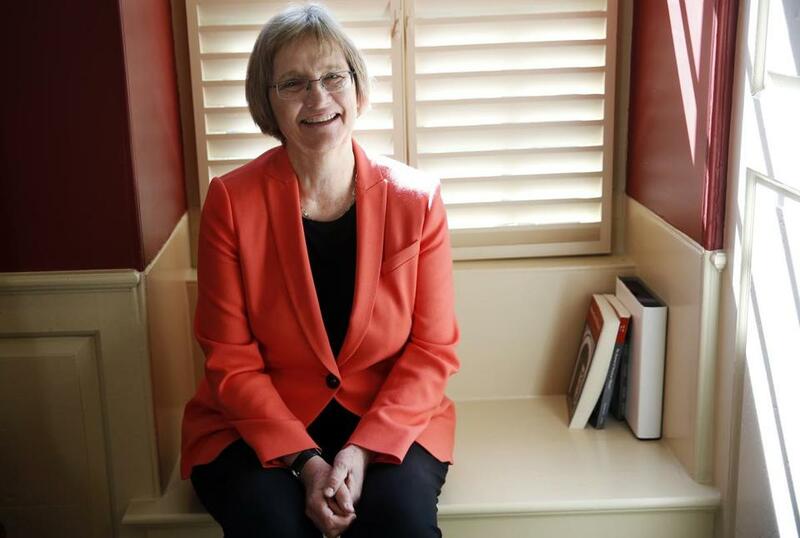 After her final year as president, the Civil War historian and Virginia native will take a year of sabbatical to focus on academic work, according to Bill Lee, the senior fellow of the Harvard Corporation, the university’s governing body. For students, the defining issue of Drew Faust’s legacy will likely be her impact on Harvard’s social landscape: the crackdown on all-male final clubs. Lee credited Faust with helping the university on many fronts but highlighted two. First, she helped Harvard become more diverse, largely through a new financial aid policy that does not leave graduates saddled with debt, he said. Second, she removed age-old bureaucratic silos to enable students and faculty from across the university to work together more closely. “At the broadest level, [her accomplishment] is bringing Harvard together as a single institution and opening it up more broadly to faculty and students who may not have been part of the Harvard community before,” said Lee, who served on the search committee that nominated Faust for the job more than a decade ago. Faust was tapped for the job in 2007 with no experience as a college president and no Harvard degree. Her appointment as the first female president was monumental. At the time, one student compared it to what it might be like if then-Senator Hillary Clinton were to run for president. Faust in her office at Harvard Wednesday. Faust’s long tenure has seen both controversy and success. She was in charge during a 2012 student cheating scandal that rocked the campus and the subsequent revelation of the university’s undisclosed search of 14,000 university e-mail accounts. She convened a sexual assault prevention task force in 2014 to address concerns about the school’s handling of such cases. Last fall she suspended the men’s soccer team after the discovery of a lewd online “scouting report” of female athletes first created in 2012. The university’s $36 billion endowment has been the source of much strife over the past decade. It lost 27 percent in the worst year of the financial crisis — fiscal 2009. The $11 billion in losses led to a cash crunch at Harvard as well as layoffs. Lackluster investment performance has held back the fund’s recovery and resulted in poor results compared to peers over a decade. A new chief executive hired in December is shaking up the organization and cutting roughly half its staff. Plans for an ambitious new Allston science and engineering campus paused in 2010 as a result of the recession, but progress on that front has now restarted, thanks in part to $400 million in 2015 from hedge fund billionaire John A. Paulson, whose gift was the largest-ever donation to a US university at the time. Faust has also led the school through a time of social change on campus. Diversity and inclusion have become central causes for students and administrators not only at Harvard but on campuses across the nation. Even so, Faust’s team has met significant pushback from faculty and students over its effort to curtail a group of off-campus, male-only social clubs, which administrators say foster a party culture that leads to sexual assault. Faust has also confronted concerns about the institution’s ties to slave labor. Prompted in part by the research of some students and faculty, Faust along with US Representative John Lewis installed a plaque in 2016 to honor four slaves who helped build part of the campus. Over the years Faust has taken strong stances on several major higher education policy issues. She advocated for repeal of the “Don’t Ask, Don’t Tell” policy that banned openly gay people from the military, pledging to return the Reserve Officers’ Training Corps to Harvard upon the policy’s repeal, which she did beginning in 2011. She has also pushed for the rights of undocumented students and stood up for the tax-exempt status of university endowments before Congress. Faust grew up in the Shenandoah Valley in Virginia in a white farmhouse on hundreds of acres with a view of the Blue Ridge Mountains. At Scaleby, her grandmother’s nearby estate, she and her three brothers swam in the pool and read by the fire in the Georgian mansion with crystal chandeliers and a ballroom on the top floor. As a girl, she joined the 4-H club and raised a beef cow. She has often told a story about how she challenged racism and sexism from a young age. At age 9, upset by her all-white church and school, she wrote a letter to President Eisenhower asking him to end segregation. She went on to protest the Vietnam War and march for civil rights in Selma, Ala.
Faust came to Harvard in 2001 after she was recruited to become dean of the Radcliffe Institute, a vestige of the former women’s college that had officially joined with Harvard University six months prior. Five years later, Faust emerged as a finalist for the job of president in a search precipitated by the unexpected departure of president Lawrence Summers. Summers clashed with faculty and sparked controversy with comments about women’s aptitude for science research. Faust earned $1.2 million in total compensation in 2014, the most recent year for which data is publicly available. News of her departure brought mostly praise for her tenure. MIT president L. Rafael Reif, who with Faust launched the online distance learning program edX, called her calm, wise, and comfortable with herself. She was a smart advocate for the arts and humanities as well as science and innovation, he said. Judith Block McLaughlin, a professor at the Harvard Graduate School of Education who mentors college presidents, has watched thousands of university leaders and described Faust as singular. Each time Faust speaks to McLaughlin’s cohort of 50 new college presidents, they come away impressed not only by her credentials but also because she speaks to them as equals, she said. “She in every respect represents the best of Harvard but without, at least in their sense of her, the elitism that makes them feel excluded,” she said. William Greenlaw, who graduated last month and served on the Undergraduate Student Council, had a mixed review of the president. He commended her work to remove historic emblems of white oppression but said she could have done more to address an entrenched culture of sexual assault. “Hopefully some new leadership can preserve the good things that Drew Faust has done but also come to terms with what students want on other issues,” he said. Beth Healy of the Globe staff contributed to this report. Laura Krantz can be reached at laura.krantz@globe.com. Follow her on Twitter @laurakrantz.